Performers include: Jack Angel, Michael Bell, Peter Cullen, Kevin Michael Richardson, Neil Ross, B.J. Ward, Lennie Weinrib, and Tress MacNeille. 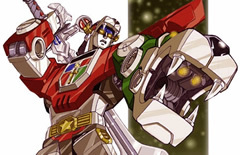 A group of young Galaxy Alliance pilots command five robot lions which, in times of serious threat, combine to form a large, sword-welding, fighting machine known as Voltron. The Voltron Force protects the planet Arus and its ruler Princess Allura from the evil King Zarkon, his son Lotor, and the witch Haggar, who can create huge Robeasts to terrorize the people of Arus. The members of the Voltron team are black lion pilot and Commander Keith (Neil Ross); red lion pilot and second-in-command Lance Charles McClain (Michael Bell); young green lion pilot Darrell “Pidge” Stoker (Neil Ross); strongman and yellow lion pilot Tsuyoshi “Hunk” Garett (Lennie Weinrib); Norwegian blue lion pilot Sven Holgersson (Michael Bell); and Princess Allura (B.J. Ward), who later takes over for Sven. Voltron continues to attack on Planet Doom with the psychic Queen Merla’s help. A feature film based on the characters is currently in the works. • The first 52 episodes were originally produced in Japanese and were later dubbed for U.S. audiences. The series proved so successful that 20 additional episodes were created specifically for English-speaking viewers. • Episodes focusing on other Voltron teams were integrated into the Voltron syndicated package, resulting in 123 total episodes. 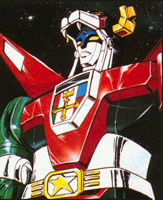 • In February 1986, the “Fleet of Doom” special aired and united the Lion Voltron Force and Vehicle Voltron Force teams. Though it debuted after the show ended, chronologically it fits midway through the series.